Pupil and assistant May 1794 - September 1808. 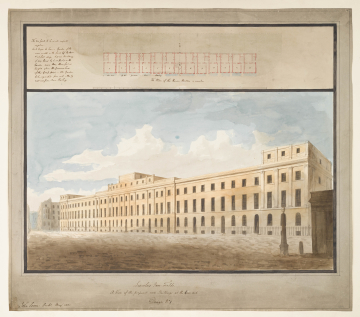 Entries for the scheme appear in the Soane office Day Book from 21 May to 26 May 1800. Seward is given as the draughtsman except on 22 May when it was Joseph Gandy and Seward. The client is described as :'The Trustees of the Lincolns Inn Fields' of which Soane was one. The plans pf the thirteen houses vary so that while all have a back door, the end houses have side entrances. The front doors of the houses to the left are placed to the left and those on the right to the right while in the middle, No.7 is a little wider than the other houses and has a door in the centre.